In June of 2011, Plantronics released the new Savi 700 Series of wireless office headsets. The Savi 700 series offers upgrades to its predecessor (the Savi Office Series) in both design and functionality. The Savi W740 replaces the Savi Office WO100. 3-way connectivity – Connect to your PC, Mobile and Desk Phone. Auto-subscribe – Automatically subscribe up to 3 guest headsets to base by simply docking the headset to the magnetic docking station. 0.7 oz vs. 0.9 oz – Lighter headset for more comfortable wearing. Replaceable earbuds – Replace earbuds without having to replace headset. Longer range – 350 feet vs 300 feet of range gives you more freedom of movement. Unlimited Talk Time – With the Hot Swappable Battery, you get unlimited talk time with the Savi W740 and W745. 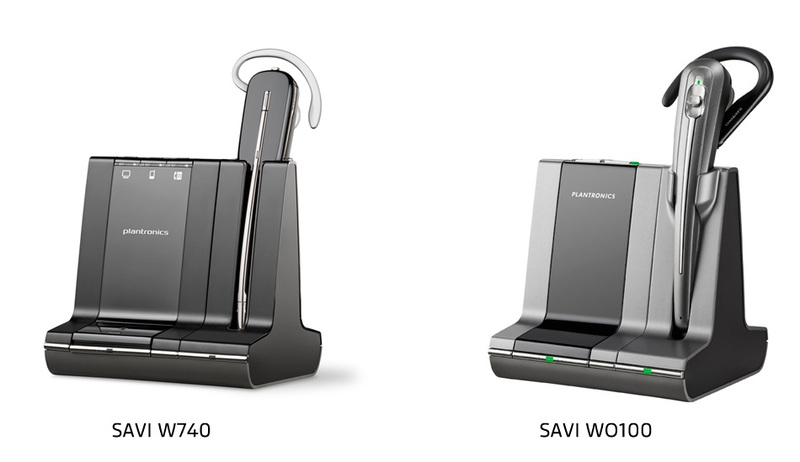 The Savi W740 is available as a single headset system or bundled with the HL10 lifter. Wireless, Convertible Wearing Styles, Monaural UC Office Headset with Remote Call Control. Connects to Deskphone, PC and Mobile. Wireless, Convertible Wearing Styles, Monaural SfB Optimized Headset with Remote Call Control. Connects to Deskphone, PC and Mobile.